"Oh look, another FO! ", uttered in a nonchalant tone of voice whilst eyelashes are batting away innocently. Ok, so what? Yes, it's another FO, dammit! But in my defense this was finished weeks and weeks ago in hopes of making a KAL deadline (which it didn't cause it took forever and a day to dry and I couldn't get proper photos of it taken before the KAL was over), and I still didn't get the chance to take photos of it until the other day. When the family and I came home after grocery shopping. And the Munchkin was fast asleep in the truck. And Brett was actually willing to take the photos - albeit for only 5 minutes (he doesn't understand why I want to take 50 or so photos when only a handful will actually make it onto the blog). I think I would have been better off trying to find the missing little tripod piece that attaches the camera to the tripod than have him take photos. We're talking major artistic differences here. His patience had run thin pretty fast (he thought 4 photos was enough, I didn't think so) and he was getting hungry. So this post only gets a measly two photos. Sorry. No FO eye candy. Not this time. Anyhoo, there's really not much to say about this project that I haven't already said in the last post about it. Even though it was a relaxing knit and the pattern was extremely easy to memorize to the point where it just became intuitive, I did feel like I was in a knitting black hole. Mind you, one should never measure their work after only knitting half a round. Cause then it really feels like you're getting nowhere. Trust me. In total I used 3 skeins of yarn for this (with no idea what to do with the fourth skein...ugh, leftover yarn! ), and had used the spit splicing method to join in new yarns, which worked beyond perfectly on this single ply yarn. I didn't knit the full 14", instead I stopped at the 13" mark. I know, I know...you're probably thinking that I copped out and should have just gone that extra inch to do the full width. Well, technically I could've but I didn't want to have to break into the fourth skein just so that I could do one more round before binding off. Oh! And the bind off. Man, it took the last half of knit night to bind this bad boy off. So.many.stitches! But oh, did it ever feel so good to bind off that last stitch! I was so happy that I had even whipped out my darning needle and wove in my ends right then and there! Crazy, I know. But that's how happy I was to finish this project! It was just that glorious! I'm not saying that I didn't enjoy knitting this pattern, cause I truly did. Every time I stopped to look at my work I would silently marvel at how lovely the lace is and how ingenious it was that the whole thing was reversible. The more I worked on it, the more I fell in love with the colour. But what I didn't like? The fact that my yarn was shedding like a mofo. I don't know what's up with me and shedding yarns lately, but I was constantly picking fibres from out of my mouth, and every two seconds I was rubbing my nose and trying to swat away the rogue fibres that felt the need to attach themselves to my nostrils. I should have looked at the yarn label more closely because the mohair content totally eluded me and I was wondering what kind of evil sheep sheds this much unruly fibre. The mohair fooled me again when I went to soak and block this cowl. I knew that yarn dyed red can bleed a bit during the soaking process, so I wasn't all that shocked when I went to take the cowl out of its bath and saw pink water. What did shock me was the fact that the yarn dyed the towels red while I tried to squeeze the excess water out, and then after four days of drying and I was finally able to unpin this beauty from the blocking mats I saw the perfect bright red rectangle stain on my towels. Seriously. A perfect rectangle. Bright red. I had immediately scooped up the towels in hopes of shoving them into the washing machine pronto to see if I can save them when I discovered that the yarn had also dyed the blocking mat where the cowl was!! It was just red everywhere I looked. Being paranoid that the dye would transfer to other projects while they dried, I quickly attacked the area with a Magic Eraser and went at it like a crazy woman. I love Magic Eraser. I really do. Thank you Mr. Clean for saving my sanity. Back to the cowl. So the lace blocked out beautifully. I was ecstatic that the lace opened up so nicely and that the yarn had softened enough that it wasn't über scratchy like it was in skein form. But I did over do it on the blocking front. I know I'm an overly aggressive blocker, like, to the max. Yet I should have held back on this. I had tugged and pulled it so freakin much that it stretched out a fair bit and now the cowl needs to be worn wrapped around my neck three times. Not that I don't mind, cause it definitely fights off any chill that tries to creep into my jacket, but I had this vision in my head that I would look as lovely and elegant as Julie (the designer of this cowl) in her pattern photo...with the cowl draped oh so effortlessly chic-ly with no weird gapes between the wraps. 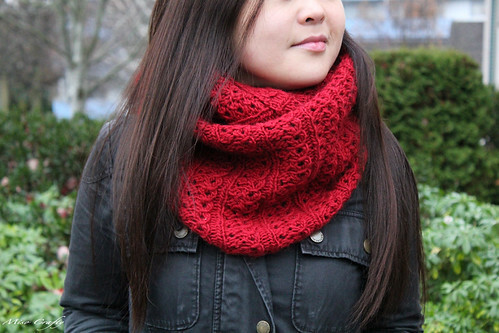 I could re-block the cowl, but I don't want to go through that red fiasco again. That, and I'm too lazy too. Amazing, it looks so good against your complexion! I envy your ability to pull of such a luxurious looking red! Thanks darling! :) I think jewel tones are the only things I can pull off. Put me in pastels, and people will be running the other way! Yes! You should definitely cast on for one! It's so easy peasy and gratifying when finished. 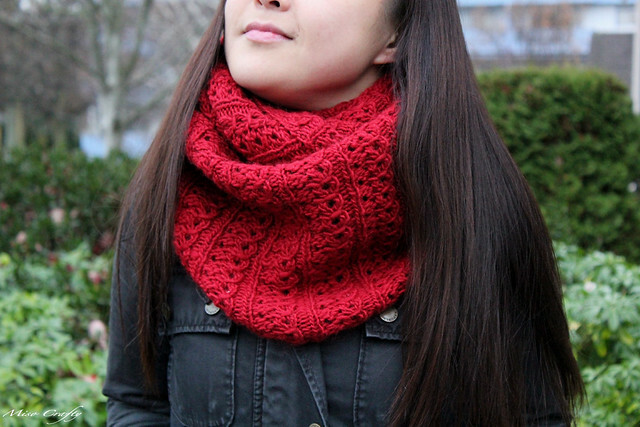 I think everyone needs at least one cowl made from this pattern in their wardrobe!